The courtyard of Retnamma’s house resembles a battlefield. There are dead giant snails strewn around, slime oozing from their brown conch-shaped shells. “These are the ones I killed last night with salt,” says the 60-year-old resident of Konni village in the foothills of the Western Ghats in Kerala. “I was killing these cursed creatures in the morning, too, or they would have invaded my kitchen,” she adds while exclaiming, “Look, there is one clinging to the bathroom door!” There was indeed a Giant African Snail clinging to the door. There were more, on the outer walls of the house. The snails like to nibble on lime and cement walls. The scene seems to be right out of a Hollywood flick—giant creatures swarming all over, destroying and consuming whatever comes their way. A fully grown snail measures 20 cm in length, seven cm in thickness, and can weigh up to 750 gm. The snails emerge in hordes at night from burrows and under rocks where they hide during the day. Konni in Pattanamthitta district was once famous as a centre for taming elephants. Now, it is gathering a reputation for having a multiplying population of Giant African Snails (Achatina fulica). The mollusc is listed as one of the top 100 invasive species. They were first sighted in Konni about four years ago. Initially, the invasion was restricted to ward 11 of the Konni gram panchayat. It has now spread to six more wards. The mollusc finds the dampness and moisture prevalent in Konni all year round very agreeable. It hibernates in winter, emerges with the summer showers and multiplies as soon as monsoon sets in. The snail lays as many as 400 eggs at a time, of which about 380 (95 per cent) hatch; up to 1,200 eggs are laid in a year, says Ratheesh Babu, a social worker. 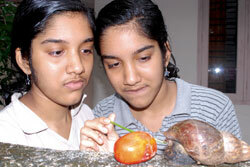 His twin daughters, Swetha and Swathy, students of class XI, studied the snails for a year with the assistance of the science club in the Republican Vocational Higher Secondary School where they study. “We were forced to undertake our own study because the government did precious little,” says Babu. The young researchers found that the snail count was 800 on each cent of land (one cent equals 0.004 hectare) in 2009. It multiplied to 7,000 to 8,000 in one year. T V Sajeev, scientist with the Kerala Forest Research Institute (KFRI) at Peechi in Thrissur district, confirms these findings. He has studied the snails in Konni and explains that the snails are hermaphrodites. Hence, one snail is enough to breed and lay eggs, thus doubling the intrinsic growth rate, unlike other snail species which require a male and a female for breeding. They are spreading to new areas quickly because just one snail, which may find passage in a vehicle passing through Konni, is enough to start a new family branch. Sajeev says the snail may have found its way to India from Myanmar where 85 per cent of the timber import to India originates. Following globalisation, export and import of timber has multiplied and quarantine procedures are either not observed strictly or are blatantly ignored, he says. The depot at Willingdon Island in Ernakulam, where the imported timber is unloaded from ships, is heavily infested with giant snails since the past few years. Konni has a dozen saw mills; it is possible the snails may have reached the mills through timber brought from the depot, says Sajeev. The giant snail is an exotic species and hence its natural predators do not exist in Konni. This helped it multiply unhindered and it became invasive. The snails devour 500 types of vegetation, says Sajeev. They eat through walls in their search for calcium for their shells, says C Nandakumar, professor at the Kerala Agriculture University who studied the snail invasion in 2009. The giant snails could be seen gnawing a banana plant next to Retnamma’s house. They were atop a papaya tree, too. “They are anywhere and everywhere,” says Haneefa, Retnamma’s neighbour. The snails are a health hazard, too. The slimy secretion from their bodies causes itching, discolouration of skin and nausea. The Konni panchayat has tried various ways to get rid of the snails, after Babu filed a complaint with the ombudsman for the local self government institutions who directed the panchayat to take effective measures. Initially, a bait—snail kill—was used on the advice of the agriculture department. “But it was withdrawn,” says Haribalan, the panchayat secretary. This was after it was realised that the bait, which contains metaldehyde, an organic compound, is harmful to animals and human beings and also contaminates soil and waterbodies. But Nandakumar says that snail kill molluscicide is still one of the good methods, provided it is used in a controlled manner. Picking by hand and sprinkling salt was the next method adopted. For this, workers, mainly women, were engaged under the Mahatma Gandhi National Rural Employment Guarantee Scheme. But using salt in large quantities affected the soil. What’s more, the job required salt to be sprinkled on the underbelly. The snail retreats into its shell as soon as it senses a threat and sprinkling salt on the shell after that has no effect. The panchayat is yet to decide on the next plan of action. Panchayat president Babu Veliyath says the panchayat is launching a three-year programme to eradicate the snails with a budget of Rs 18 lakh. The local body has received in-principle sanction of Rs 6.4 lakh for 2011-2012. But the panchayat has not decided what measures to adopt now to eradicate the pest. 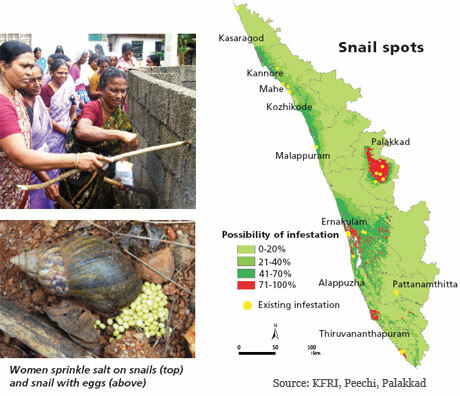 KFRI has identified 29 other spots in Kerala (see map) which are under the threat of the invasive snails. The institute happens to be the secretariat of the Asia Pacific Forest Invasive Species Network, which has 33 member countries that cooperate in monitoring and eradicating forest invasive species in Asia-Pacific region. KFRI recommends spraying a solution of copper sulphate and tobacco to get rid of the snails. Sajeev says what is happening in Konni is representative of other “snail spots”. He adds that one of the reasons for the snails making a comeback each year in increasing numbers is slackening of vigilance once the snails go into hibernation. Land left untended and heaps of waste left around in villages provide fertile breeding grounds for the snails when they awake from slumber. Investing in molluscicides and other agents solely seems like a waste of time, effort and money. The problem needs to be nipped in the bud- where are these creatures coming from? And how are they handled in that part of the world? The funds reported allotted for the eradication program has to be effectively used and effective control brought into effect. I have noticed the presence of these creatures near the International Airport Terminal, Trivandrum too in the recent past. Gradually this is going to affect other parts of Kerala and neighboring States too. The local bodies concerned have to take concerted efforts treating this as a huge menace affecting the mankind. Swetha and Swathi have done a great work. They deserve all encouragement. Earlier, there is a balance between the snail and fireflies population. As there is an increase in pesticide pumped in to our farm lands there is an imbalance is created. Now days, we rarely notice fireflies during monsoon season indicating the decrease in firefly population as a result the population of snail is increased. This problem has been there for about 6 to 7 years now. A team of five students from Mahe (Pondicherry UT) had carried out a research project on african snails under the National Children's Science Congress (NCSC) conducted by the Department of Science & Technology and they studied the characteristics, feeding habits, growth rate of the snails under different feeding habits, loss of weight under starvation etc. This project was selected to the national level congress also. Interestingly, the snails are used as food in some countries. Recently there was an article about them being used for monitoring air quality as the snails breathe like human beings and are very sensitive to pollution also. See the link http://in.reuters.com/video/2011/02/03/african-snails-the-latest-weapon-in-poll?videoId=184375845 for more details. turbellarian flat worm, has been reported to be successful in controlling GAS in Guam, Philippines and Maldives. However, this worm has also been implicated in the decline of native snails. This is the most unusual crisis people are facing, but i feel there could be a better & environment friendly option to get benefit from them. As we all know its a ORGANIC material, it could be degraded completely and the residual could be used as the manure. The answer to this how is simple. Linkâ”œÃ‚ping [â•¦Ãªlâ•”Â¬nâ•”Ã²â”œÂ©â•¦Ã‰pâ•”Â¬â”¼Ã¯] is a city in southern Sweden, This city might provide us the solution of the organic waste. Yes, if we catch them, Crush them using industrial crusher and to convert them meat & broken shells. Technology to get them converted into the useful BIOGAS & manure could be requested from Sweden. As we do have some of the Organic waste generated by Fishing Industry, Poultry etc. in the form of organic industrial waste (usually uneatable and useless body parts of fish, chicken, goats etc. ) these materials could be utilized with them. They are available for negligible cost, and converting them into useful energy and manure would be benefit to society. The solution to crush them may look weird but its most environment friendly option we have, most importantly we can now be using them for energy that will avoid threat to environmental pollution in the form of viral or bacterial infections and diseases. In other words, a small scale project for this cause could be a community benefit. As Piyush cited and as Ratheesh vouched, cost effective and simple techniques can be put in place were the civil authorities can respond fast with conviction. It is an uphill task in Kerala to enthuse the local bodies on the way they should move. As of now, what has been tried is to shake them off their slumber, introduce them to the simple method developed by Swathy and Shwetha and to provide continued scientific and technical support.